Founded at the turn of this century by frontman R.D. 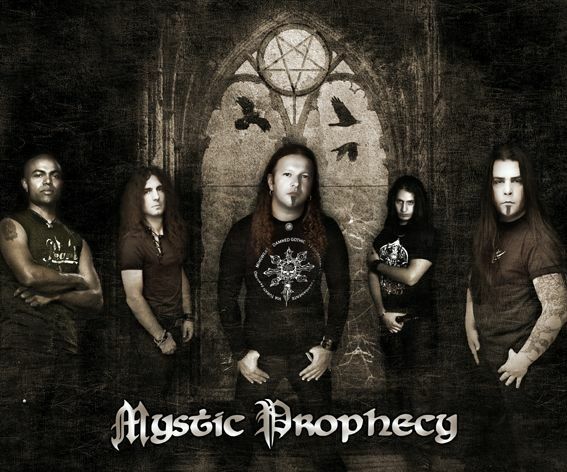 Liapakis, German power metal outfit Mystic Prophecy is one of those bands that continues to soldier despite being plagued by line-up instability. 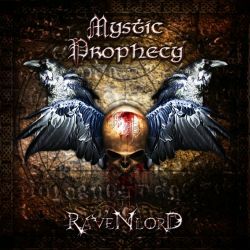 Although Liapakis is the only remaining original member (from a cast that included none other than guitar wunderkind Gus G.) and drummer Tyronne Silva is newly ensconced behind the kit, Mystic Prophecy continues to dish out quality metal with their latest effort Ravenlord. The band, whose keyboardless style has more in common with Iced Earth than Blind Guardian, plies their trade with a heavier hand than one usually associates with the power metal genre. Therein lies the appeal of Ravenlord, and my annoyance at having let Mystic Prophecy fly beneath my radar for so long. Besides the crushing heaviness of the guitar sound (expertly generated by Markus Pohl and Constantine) and the glorious lack of any keyboard touches whatsoever, Liapakis enhances the band's dominating sound by delivering the lyrics in a fashion similar to that of Bruce Dickinson and Dio. His delivery is strong, emotive, a bit gravelly, and devoid of any of the high-flying vocal acrobatics commonly associated with power metal singers. Liapakis delves into territory quite opposite of the falsetto, in fact, by adding a bit of a thrashy snarl during tracks such as "Die Now" and "Damned Tonight". Ravenlord actually teeters on the edge between power metal and thrash. The songs that lean more to the dark power metal style are the album's strongest, though. The title track, with its infectious, crushing riffs and deliberate mid-tempo pace is a highlight, as is "Hollow". The latter track is dominated by a tasty old-school riff and plenty of Zakk Wylde guitar flair, which shows up now and again throughout the album but nowhere more so than on the cover of Ozzy's "Miracle Man". That track, which rounds out Ravenlord, is a bit more uptempo than the 1988 original but remains true to Wylde's distinctive style. Although the pace of the album quickens on the thrashier tunes like "Damned Tonight" and "Endless Fire", there's little else about them to make Mystic Prophecy stand out from other modern thrash outfits. Ravenlord is a well-balanced, über-heavy album that fans of aggressive power metal will enjoy. There are some questionable moments, such as the metalcore breakdowns on "Eyes of the Devil" and the staccato riffs of "Wings of Destiny", but by and large Mystic Prophecy's latest offering is a quality slab of metal.